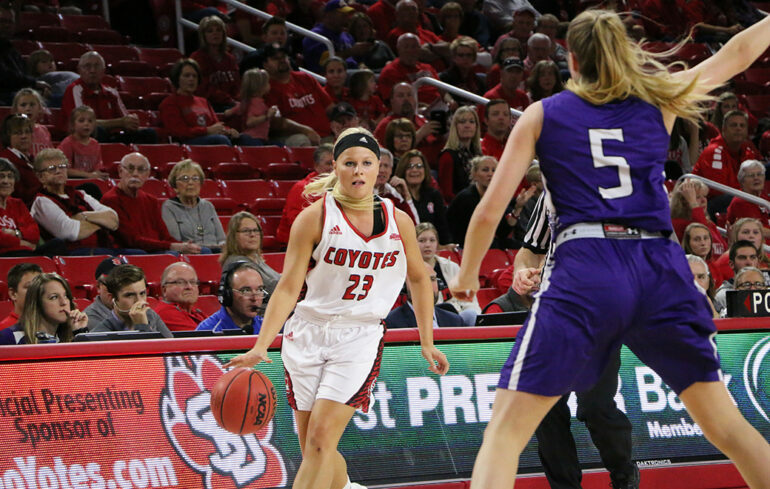 The Coyote women’s basketball team took care of business in their first game in the new Sanford Coyote Sports Center, defeating the Stephen F. Austin Lumberjacks 80-74. “Certainly an exciting opportunity to open up at home, the new Sanford Coyote Sports Center, what a great atmosphere to play a game in,” said first-year Coyote head coach Dawn Plitzuweit. The new arena was a point of pride for the entire team. For senior center Abigail Fogg, the SCSC is a dream come to life. Despite the fanfare surrounding the new arena and the new look team, the distractions of the day did little to faze the Coyotes. After falling behind in the first quarter and entering the second quarter down 19-24, the Coyotes found their rhythm and took a 38-31 lead into halftime. USD had trouble stopping the Lumberjacks from behind the arc in the first half. Stephen F. Austin shot a blistering 70-percent from deep. In the third quarter, USD continued their attack, as they took a 61-47 lead into the final quarter of play. In the fourth quarter Stephen F. Austin surged, as they outscored the Coyotes 27-19. Despite a late push, the comeback wouldn’t be enough, as the Coyotes went on to win 80-74. Sophomore guard Allison Arens lead the Coyotes on offense. She scored 21 points and dished out six assists. Abigail Fogg also came up big for USD on offense, scoring 18 points on 8-10 shooting. Early this season Arens has been big for the Coyotes on offense. She scored 28 in the team’s exhibition win over Southern Illinois University-Edwardsville and kept it rolling against the Lumberjacks. Despite her strong recent performances, Arens said she knows the high scoring every time out is no guarantee. After last year’s Coyote team lucked out with having go-to offensive players in Nicole Seekamp, Tia Hemiller and Kelly Stewart, this year’s team is still figuring out exactly who will be taking the shots. This plays into the Coyotes’ new motion offense and how Plitzuweit wants her team to run this season. With the win, the Coyotes improve to 1-0 on the season. They will embark on a four game road trip across the country, visiting Arkansas, Tulsa, UC Riverside and CSU Bakersfield before returning to the SCSC on November 30 to take on Concordia University, St. Paul. “For us, it’s a matter of learning where our kids are really comfortable and that’s going to take us some time,” Plitzuweit said.